LANSING – Michigan is lagging far behind states on the Atlantic and Pacific coasts in exploring innovative markets and uses for wood products and wood energy, experts say. And with Michigan’s abundant forestlands, identifying and developing new uses has major implications for the economy and employment across the state, not only in the north. 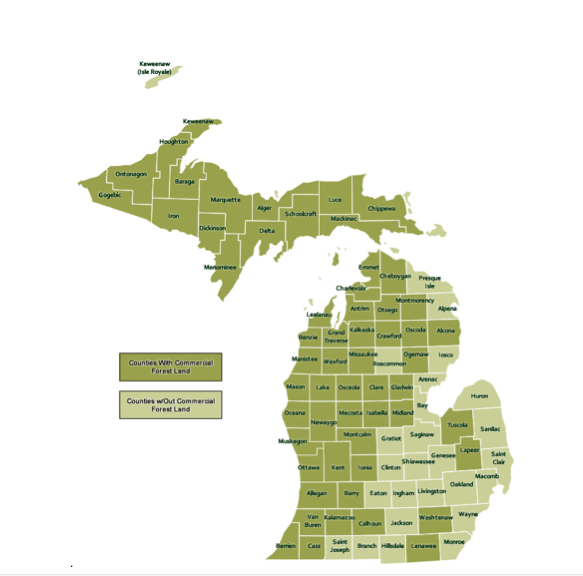 Counties with commercial forests Source: Michigan Biomaterials Initiative. “People think of the Upper Peninsula and Northern Lower Peninsula as Michigan’s woodbasket, but there are a heck of a lot of trees that grow south of Clare, and a lot of them are dead or dying,” said Warren Suchovski, a logger and forestland owner in Stephenson, Menominee County. About 55 percent of the state is covered by forests, and forestry is the state’s third-largest manufacturing sector, according to MSU Extension. It says forests support about 136,000 jobs in the state and add $17 billion to its economy. Supply isn’t a problem, said Terry Sharik, dean of the School of Forest Resources and Environmental Science at Michigan Technological University. “We’re clearly in the top 10,” he said, and many of the state’s trees are high-quality species such as the red oak and sugar maple that are prized for furniture. There’s been a great deal of media and government attention on using wood and other biomass – organic material extracted from ecosystems – as a renewable resource to generate power. One proposal – since shelved – would have built a state-subsided multimillion-dollar ethanol plant in Kinross Township in Chippewa County. The challenge is finding other ways to sustainably extract wood and other forest materials, to process them locally and to add value rather than simply shipping them out as logs. One new approach began last year with a Michigan Biofuels Initiative involving government, Michigan Tech, Michigan State University, industry, Michigan Society of American Foresters and other interests. It’s now developing a strategic plan for the state. According to Sharik, priority topics for the plan include trends and the future of biomaterials markets, private forestland, state and federal forestland and biomaterials manufacturing. And Brenda Owen, executive director, Michigan Association of Timbermen based in Newberry, cited research at Michigan Tech to find new uses for bio-materials. Other potential areas for study include nano-fibers that can be used to reinforce concrete and plastic and wood pulp extract that’s stronger than carbon fibers used in Kevlar. MSU’s Biomass Innovation Center in Escanaba is focusing on ways to quickly grow trees for use in a variety of energy systems, including ethanol and activated charcoal, and to replace coal at electricity generating plants. That research includes economic, environmental and social impacts. At the same time, center director Raymond Miller cautioned that biomass is only “one part of the solution” to the demand for energy and will never be sufficient to replace fossil fuels or nuclear energy. When it comes to finding money for research about sustainable biomaterials, Sharik noted that universities elsewhere are far ahead of Michigan, including forest-rich Oregon, Virginia, North Carolina and Maine. “They’re eating our lunch literally” in competing for huge federal grants. Meanwhile, the U.S. Forest Service has announced that it will award $5 million in grants to expand markets for wood products and wood energy. The Forest Service set a Jan. 23 deadline for grant proposals.